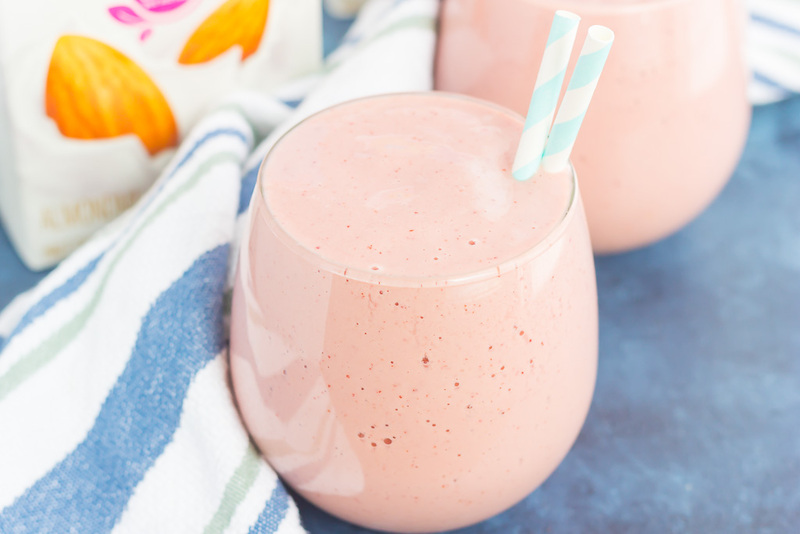 Packed with dark cherries, sweet mango chunks, and simple ingredients, this Cherry Mango Smoothie is thick, creamy, and loaded with flavor. 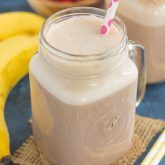 Perfect for a quick breakfast or on-the-go snack, this easy smoothie will keep you going all morning long! Cheers to a new year and a new you, friends! Sounds kind of cheesy, but I love to think of the new year as a fresh start for a lot of things. Things like eating better, exercising more, taking more time for myself, working less, playing more, that sort of thing. And I know a lot of people feel the same as I do. So tell me, what are your resolutions or goals for the year? I’d love to know and also how you plan on achieving them! One small goal that I’m setting for myself is to consume a little less dairy and a little more plant-based nutrition. While I don’t eat a lot of dairy on a daily basis, it does upset my stomach at times. And since I’m working on eating better, plant-based products are something that I’m really working on eating more of. 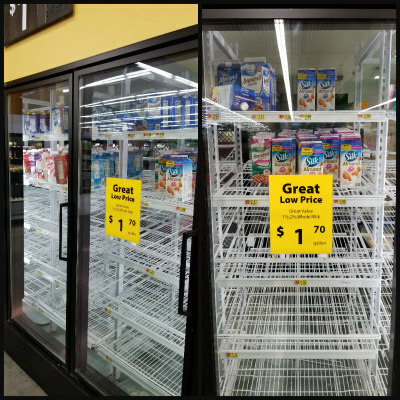 When I was shopping at Walmart last week, I stumbled across Silk Almond Unsweet Vanilla and Silk Almond Unsweet Original. Have you tried it before? Silk is dairy free and lactose-free, which is perfect for my occasional stomach issues. 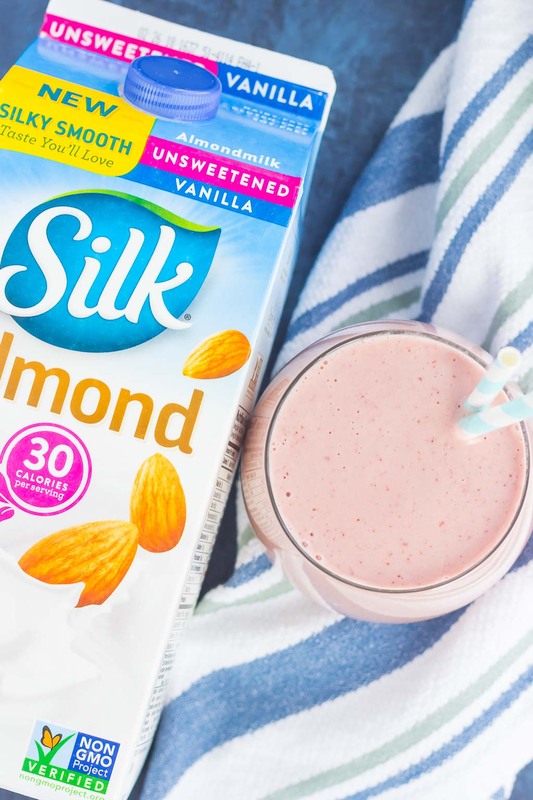 Silk Almond is simple, great tasting, and made with natural ingredients. It has 50% more calcium than milk and is produced without GMOs. Silk Almond is also low in calories and is an excellent source of antioxidants. Want to learn more? Head over to this site to learn more about Silk. You can also go to the Walmart site to check out their Silk products. 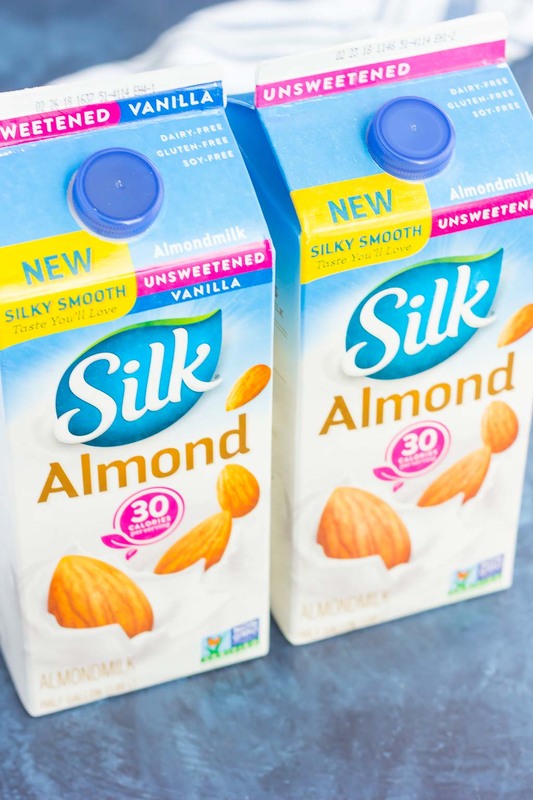 And since I’m trying to eat better and consume more of a plant-based diet, I knew Silk Almond Unsweet Vanilla and Silk Almond Unsweet Original would be perfect for me. 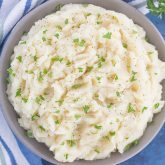 It’s a delicious way to create lightened up recipes that are better for you! And that’s where this Cherry Mango Smoothie comes into play. And you know me, I love my smoothies! It’s such an easy way to get your fill of nutrition and flavor. And with so many different fruits and Silk products to add to your smoothies, it’s simple to customize it to your taste. 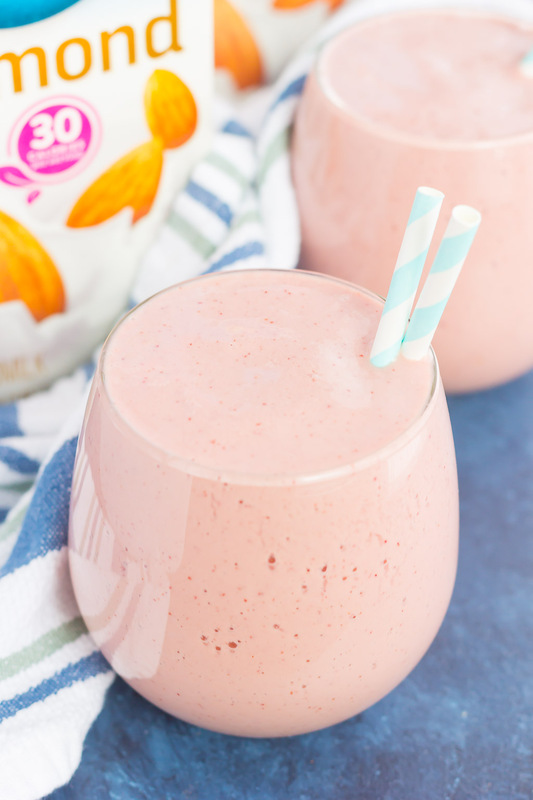 Now let’s get cover how to whip up this easy and oh-so creamy Cherry Mango Smoothie! 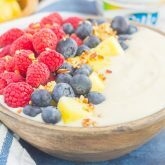 To start, you’ll add some frozen dark cherries, frozen mango chunks, some Silk Vanilla Dairy-Free Yogurt Alternative, Silk Almond Unsweet Vanilla, and some honey to sweeten (if desired) to the canister of your blender. Blend away until it reaches your desired consistency (I like my thick and creamy!) and then pour into two glasses. It’s really that simple! 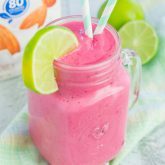 This Cherry Mango Smoothie is slightly sweet, packed with flavor and nutrients, and perfect for the new year, new you! So grab those ingredients and whip up this delectable drink today! In the canister of a blender, combine the frozen cherries, mango, Silk Vanilla Dairy-Free Yogurt Alternative, Silk Almond Unsweet Vanilla, and honey (if desired). Like what you see? Then be sure to head to your nearest Walmart to see their selection of Silk products. You can also follow Silk on Facebook, Twitter, YouTube, Pinterest, and Instagram. Your goals sound a lot like mine, and I definitely aim to consume more plant-based nutrition this year! I always use almond milk in my smoothies, etc. and Silk is my go-to brand. I love the sound of the cherry-mango combination and need to whip up a batch of this soon! Thank you, Marcie! I'm loving the taste of Silk and can't wait to use it in more recipes! I’ve definitely been on the smoothie train recently, and this combination is calling my name. I forgot how good cherries are in a smoothie. Delicious!!! Thanks for the smoothie love, Blair! 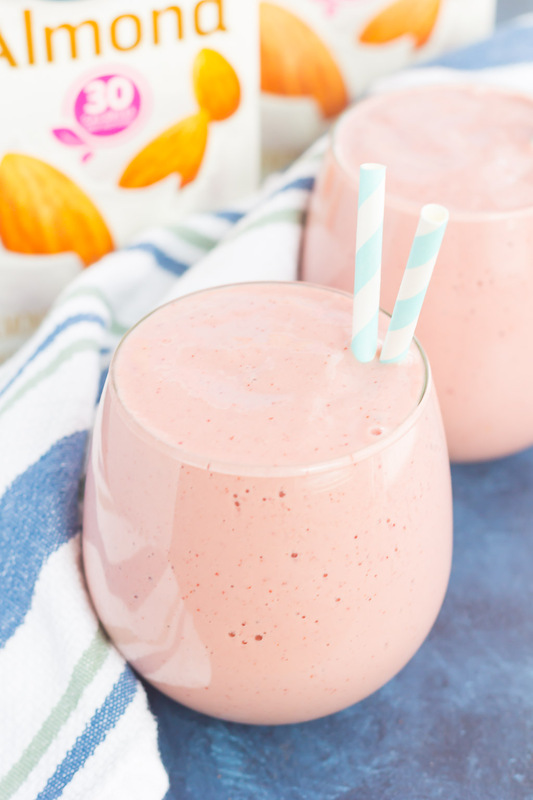 I actually have to containers of Silk in my refrigerator, so I'm thinking these GORGEOUS smoothies NEED to happen STAT! I absolutely love the color of these, Gayle, and the cherry-mango combo is just perfection! Pinned! Cheers! YES to a new planner! It definitely is the little things in life. Thanks for the smoothie love, friend! I use their unsweetened almond milk ALL the time! I am that person who buys cartons each week haha I LOVE smoothies but I always forget about cherries! Must change that! Isn't it the best? Thanks, Ashley! Love almond milk in my smoothies, it is less calories than regular milk, too! This smoothie looks gorgeous! I have some frozen cherries and can't wait to try it! Thanks for the smoothie love, friend!